The principality of Asturias lies between Cantabria and Galicia. With tiny fishing villages and wide forests, Asturias has a wealth of landscape to see. The Costa Verde (Green Coast) as the Asturias coastline is known is one of the major attractions of northern Spain and offers good fishing. At a length of 145km, the coast would take a good 6 or 7 hours to drive along it. Despite the fact that over the last few years, the shoals of the Cantabrian Sea have been depleted somewhat, more than half of the coastal village's populations still make their living from the sea. A large part of the catch is still caught with hook and sinker and as any fish expert will tell you, this is the only way to guarantee the freshest of fish. Tourism has taken a hold of the area but has yet to spoil the area. Great measures have been taken to preserve the beauty of the coastline. Mountains with high peaks, perpetual snow, lakes and narrow passes are provided by the Picos de Europa, just 40km from the coast. As you head for the valleys inland of the mountains, you come across vast green and forested areas. On the coast where the scenery becomes more intense you will find an almost never-ending line of beaches and cliffs. The region has some of Spain's best natural parks. The mountains known as the Picos de Europa stand towering over a region of fast flowing rivers, vast orchards and tiny farmhouses. Inland the area is rich in minerals. Oviedo, the capital of Asturias is home to about 200,000 people and is known for its university and its industry. 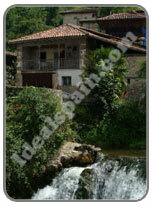 The beauty of the area is envied by many Spanish city dwellers. Asturias is a prehistoric land as the many cave paintings illustrate and was inhabited by the Iron-age Celtic tribes who fought off the Romans and the Moors. It was in Asturias that the first proper resistance to the Moors began. The whole region is scattered with impressive historical sites and monuments, many of them pre-Romanesque. A fine example is the Cathedral in Oviedo, built during the 15th and 16th century, a magnificent example of late Gothic architecture. The variety of sporting activities here is huge, from fishing to horse riding and hiking, climbing to skiing and white-water sports. There are also many good golf courses. Green Spain is fast becoming a new industry in itself in the form of Éco-tourism´. Freshwater fishing particularly for trout and salmon is excellent in the many rivers, lakes and reservoirs. Sailing, windsurfing and skin diving can be practiced anywhere along the coast and yacht harbours such as that at Gijon are particularly good. Asturian cooking is well known for its fine and simple ingredients. The best known dishes include la fabada (stew made from large beans). Seafood from the Bay of Biscay features highly in the menu, as do a number of locally produced cheeses, all washed down with locally produced cider. The local tourist office can be contacted on (+34) 985 213 385.